Nouns refer to persons, animals, places, things, ideas, or events, etc. Nouns encompass most of the words of a language. Person – a name for a person: - Max, Julie, Catherine, Michel, Bob, etc. Animal – a name for an animal: - dog, cat, cow, kangaroo, etc. Place – a name for a place: - London, Australia, Canada, Mumbai, etc. Thing – a name for a thing: - bat, ball, chair, door, house, computer, etc. Idea – A name for an idea: - devotion, superstition, happiness, excitement, etc. A proper noun is a name which refers only to a single person, place, or thing and there is no common name for it. In written English, a proper noun always begins with capital letters. Australia (there is no other country named Australia; this name is fixed for only one country). A common noun is a name for something which is common for many things, person, or places. It encompasses a particular type of things, person, or places. Example: Country (it can refer to any country, nothing in particular), city (it can refer to any city like Melbourne, Mumbai, Toronto, etc. but nothing in particular). So, a common noun is a word that indicates a person, place, thing, etc. In general and a proper noun is a specific one of those. An abstract noun is a word for something that cannot be seen but is there. It has no physical existence. Generally, it refers to ideas, qualities, and conditions. Example: Truth, lies, happiness, sorrow, time, friendship, humor, patriotism, etc. A concrete noun is the exact opposite of abstract noun. It refers to the things we see and have physical existence. Example: Chair, table, bat, ball, water, money, sugar, etc. The nouns that can be counted are called countable nouns. Countable nouns can take an article: a, an, the. The nouns that cannot be counted are called non-countable nouns. Abstract nouns and proper nouns are always non-countable nouns, but common nouns and concrete nouns can be both count and non-count nouns. A collective noun is a word for a group of things, people, or animals, etc. Example: family, team, jury, cattle, etc. Collective nouns can be both plural and singular. However, Americans prefer to use collective nouns as singular, but both of the uses are correct in other parts of the world. Sometimes two or three nouns appear together, or even with other parts of speech, and create idiomatic compound nouns. Idiomatic means that those nouns behave as a unit and, to a lesser or greater degree, amount to more than the sum of their parts. Example: six-pack, five-year-old, and son-in-law, snowball, mailbox, etc. 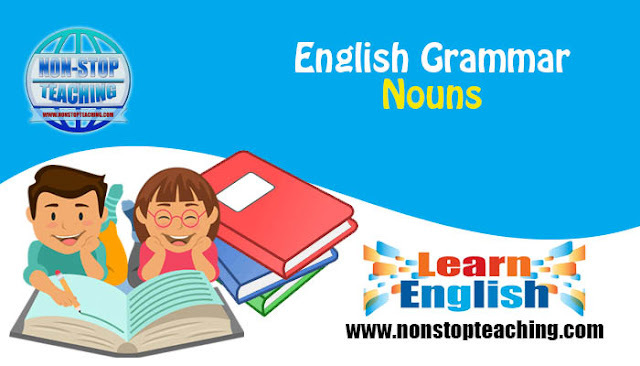 Nouns can be used as a subject, a direct object, and an indirect object of a verb; as an object of a preposition; and as an adverb or adjective in sentences. Nouns can also show possession. Subject: The company is doing great. Roses are the flowers of love. Direct object: I finally bought a new mobile. Indirect object: Max gave Carol another chocolate. Object of preposition: Roses are the flowers of love. Adverb: The train leaves today. Adjective: The office building faces the mall. Possession: The lion’s cage is dangerous. My brother's daughter is adorable.